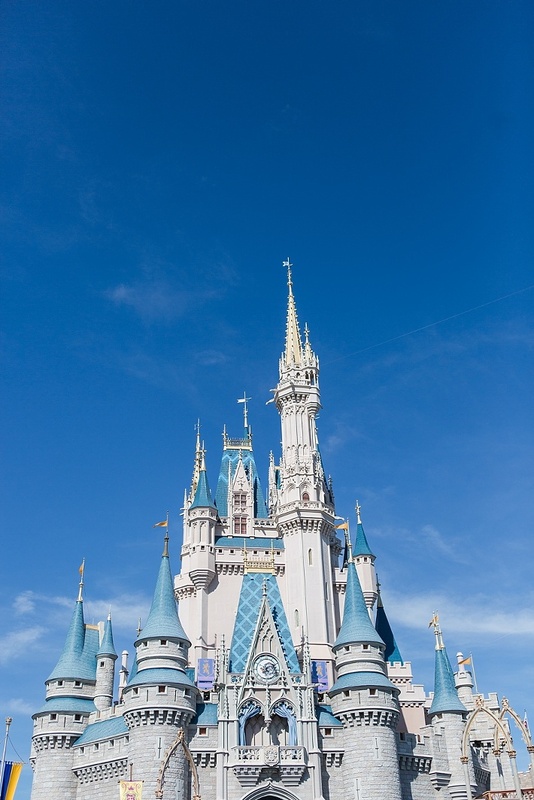 If you missed part 1 of our Disney World Experience, check it out here. I talk about how the first day we headed to Disney Springs and how Paisley got made into Princess Belle at the Bibbidi Bobbidi Boutique. With Day 1 at Disney Springs, we did Day 2 at Magic Kingdom. We decided we were going to do only ONE day and so we had to make some important decisions and get all the things done! I will start off by talking about getting Fast Passes. So if you are staying at a Disney World Resort you can get fast passes 60 days ahead of time. If you are like us and stay elsewhere you can only get it 30 days ahead of time. You need to log into your account at 7am and have some sort of plan about which Fast Passes to get. MAN….this was stressful. You want to get your Fast Passes earlier in the day because once you use all three you can get more throughout the day. So when we logged on and saw what was available we had to decide on something we REALLY wanted to do vs. something that was earlier on in the day. In the minute we thought about it, less and less were available so you definitely have to think fast! We ended up getting a 9:15 Fast Pass for the Ariel ride, 10:15 for the Jungle Cruise and 4:30 for Belle’s Enchanted Castle. If you’ve never been to Disney World it takes a while to actually get to the entrance. You have to park far away, take a tram to the monorail station, and take the monorail to the entrance. I would recommend getting to the parking lot an hour before you plan to enter the park itself. We were trying to get there by 9 when the park opened but didn’t actually get to the parking lot until 9. I figured it would take a bit of time but I did not know it would take an entire hour to get to our first Fast Pass ride. Talk about stress and crowds! And we went in off season…. I really didn’t take TOO many pictures but I did have to document some of the princess meetings because you know…Paisley and princesses are kind of a big deal. I decided to bring my regular camera (canon 5d mark iii) and my 24-70 lens with one flash. I could fit this all in one small camera bag and we also brought our BOB jogging stroller as well as snacks for Joy and an ergo to carry her in. You honestly don’t use the stroller that much because you can’t bring them in the lines, but I am glad we brought it. Now to our day. The first ride we made it to was Under the Sea Journey of the Little Mermaid. We now know that we shouldn’t have wasted a Fast Pass on this ride because legit the wait was always like 10 minutes. But I will say that Paisley loved this ride and still talks about it. We then headed to the Jungle Cruise and in all honesty it was lame. We waited for like 30-45 minutes even with a Fast Pass and I don’t even know why we did it. You just ride on a boat and see fake plastic animals and have a person talking to you and making lame jokes. Waste of time. We decided to cancel our Fast Pass for Enchanted Tales with Belle because there was a predicted low wait time so we opted just to wait and get it done earlier. 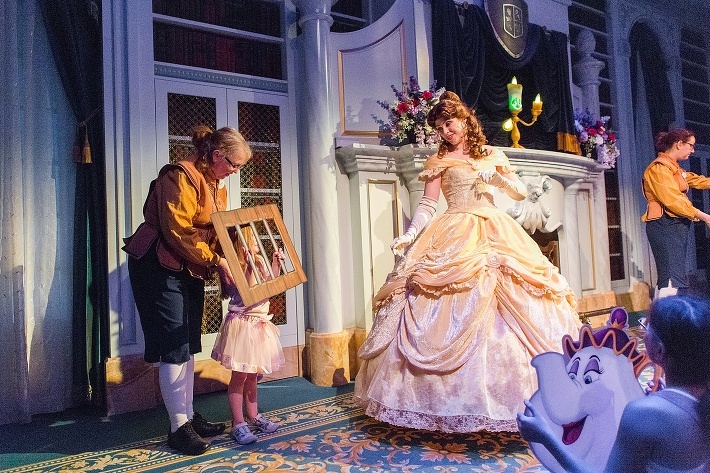 Enchanted Tales with Belle is pretty cool because the kids get selected to act out the day that Belle and Beast fell in love. Seen below is them practicing. After they practice we went into the room and Belle comes out! Paisley got selected to play Maurice. She had to shiver in the dungeon and Belle came to her rescue. It was adorable! Paisley was star struck! After that we decided to wait in line to meet Tiana and Rapunzel. But once we entered it was actually Aurora, not Tiana. Aurora ended up being my favorite princess though. It is so cool to see them in character…they have accents! Aurora asked Paisley if she would spin in her dress with her and it was one of my favorite parts from the entire day! After that we were figuring out our game plan and we saw that there was a show going on. It just made my day to see Paisley up on her dad’s shoulders watching the characters sing and dance. Paisley told me the show was called Minnie’s Surprise and she kept talking about how much fun it was to see the characters! We snuck in some other rides after the show and a quick lunch (which we packed ourselves). We figured we would bring sandwiches and then eat dinner at a sit down restaurant in the park. The other rides we did were mostly all fast passes. Because we used all our fast passes, we would just look at the one available next and book it. This worked out really well for us because it is hard to be in long lines with a baby! The next thing was the parade which Paisley absolutely loved! She requested that I take photos for her album, so here they are! Token Cinderella’s Castle pic! Next Paisley met Cinderella and Elena. They are so sweet that they get down and talk to the kids and give them a big hug. Paisley was in heaven! Last but not least was Ariel’s Grotto. Ariel was obsessed with Joy. It was hilarious! It was also cute when she was talking to Paisley saying I have 6 sisters and you have one! They use anything they can to relate to the kids and to get them to talk, even if they are shy. As we were leaving the park was closing and the fireworks were AMAZING! But…my girl does not do well with loud fireworks. I just wanted this one picture because I have one in front of these flowers when I was in 6th grade with my family so I wanted one to match. Unfortunately Paisley wouldn’t stop covering her ears for the picture but you know…pretty much typical. It was the end of a LONG day with no naps and lots of walking/standing. So I’m proud my little ones made it. The next morning we left bright and early to ride the plane back to Maryland but we left with a ton of special memories at Disney! It’s so cool how much fun things are when you are doing it for your kids! If you missed part 1 of my Disney experience, check it out here!